Over last 5 years, India's health insurance industry experienced a lot of welcome changes. Gone are the days when rules and regulations favored insurance companies. Now, policy buyers are all set to make the most of new set of regulations that in their favor. For an example, all health Insurance online policies now come with life-time renewal option. To tap into the increasing demand for comprehensive health insurance plans, a myriad of health insurers are making their appearances in the India's health insurance niche. This massive profusion of health covers makes selection of the right plan a daunting task, especially for a layman who hardly understand the features of health insurance policies. To make the lives of these people easier, I have come up with a comprehensive 15 point checklist that every prospective health policy buyers should go through. The write-up is designed as a guide for those who want to buy, renew or enhance their existing health covers. If you are on the lookout for the best health insurance plan in 2016 in India. The very first thing that you need to check is whether you should choose individual health plans for each member of your family or you should opt for one family floater policy that covers all members of your family. To make a decision you need to be aware of the merits and demerits of both types of online health insurance plans. Let's start with family floater health plans. These plans are cost-effective options as they offer large coverage to be shared among all family members. Since, all members of one family are not likely to fall sick in one policy year the coverage is usually sufficient for a family's need in one year. But, there is a catch. If you have an aged family member who is prone to frequent illness you should buy him or her an individual health policy (a senior citizen health plan for that matter if the person is over 60). The problem of keeping such a person in a family floater policy is other members might be left with no or inadequate cover because that person would make majority of the claims. Let's see how much you can save by buying a family floater plan. 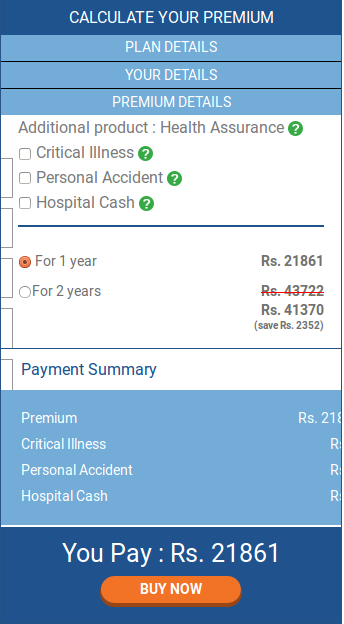 The below is the rate of Max Bupa Heartbeat individual health plan. For a sum insured of Rs. 10 Lakh, the premium for one person is 11881 for one year. 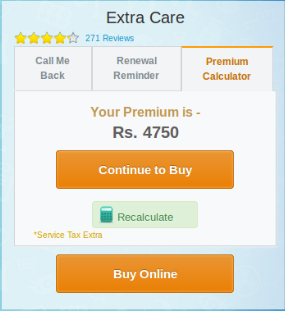 The below is the rate of Max Bupa Heartbeat Family floater health plan. For a sum insured of Rs. 10 Lakh, the premium for two persons is 21861 for one year. Had you chosen two individual plans for two people you would have to spend Rs. 11881X 2 = Rs. 23762. So, by opting for family floater plan you can save Rs. 1901(Rs. 23762 – Rs. 21861). You shouldn't make the mistake of calculating sum insured amount on the basis of today's medical expenses. Because you are likely to make claims after 15-20 years. If the hospital bill is Rs. 1 lakh today, it will rise to Rs. 15 Lakh after 20 years (assuming a modest 7.5% inflation rate). So, you should always go for higher sum insured as your health policy must cover your medical expenses when you need it most. 3. Be aware of room rent capping and choose health plan accordingly There are many health insurance online policies that come with upper limit on room rent. This means you can make claim up to the upper limit of room rent. If the room rent is above the upper limit you need to bear the additional expenses. An example will make things clearer for you. Suppose, the upper limit of room rent is 1% of sum insured and your sum insured amount is Rs 4 Lakh. There will be upper limit of Rs. 4,000 per day according to your health policy. If you admit in a hospital room that costs Rs. 10000 for renting your insurer will pay you just Rs. 4,000 per day for room rent and the rest of Rs. 6000 needs to be paid by you. Since, this clause is not beneficial for policyholders you should steer clear of such plans. To identify this type of health covers you need to search for words like 'co-pay' or 'deductible' 'sub-limits'. 5. Check the payment options in health policies Health insurance companies in India broadly follow two payment methods such as 'cashless' and 'reimbursement'. While the former method allows for cashless treatment, the latter reimburse policyholders' dues once they make a claim for reimbursement. You need to select any one of these two processes that you are comfortable with and find a suitable health cover accordingly. 6. Look out for health insurance covers with maximum entry age Most health insurance online policies in India impose an upper limit on entry age of the policy buyers. Health plans that don't come with any age limit should be your first preference. If you cannot find such a plan that meets your other criteria as well you have to find a health policy online with maximum entry age. Health insurance plans become handy when we grow older. Diseases related to old age are chronic and costly too. So, you should ensure that your medical expenses are financially protected at an advanced age. 7. Find out health plans that accept people over 45 without increasing the premium much Many health insurers don't issue insurance to people beyond 45 years especially if they have preexisting diseases. And some health insurers that accept people over 45 raise the premium steeply as they don't want to take chances of running into loss So, you have to search and trace out a health insurance policy online that people over 45 are eligible without having to pay increased premium. 8. Be aware of waiting period and exclusions of health plans The waiting period varies from one insurance company to another and can well be as high as 4 years. So, if you have any pre-existing conditions you should check prior to make purchase. Instead of ignoring this vital clause or assuming anything you should go through the policy wordings carefully. 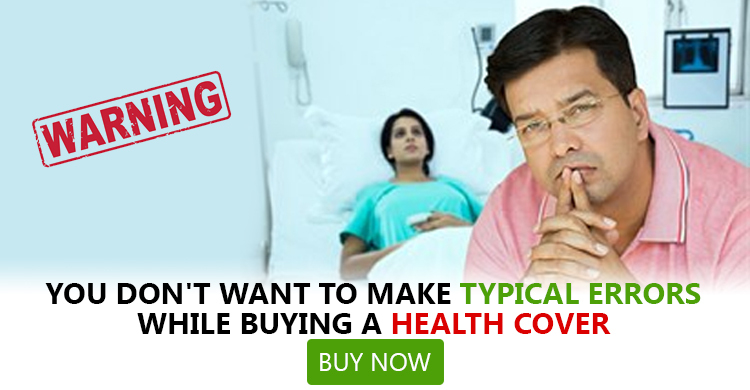 Ideally you should opt for a health insurance plan online that come with minimum waiting period. Health covers don't cover all diseases under the sun as well. All online health insurance policies come with a list of diseases and conditions that are excluded from the coverage. You need to ensure that your chosen health cover comes with shortest list of excluded diseases. 9. Enhance the coverage of your plan by opting for Super Top-up Keeping the alarming rate of inflation in mind, it is always better to have an enhanced coverage to stay secured in the future. A super top-up is your best bet to get the coverage in the range of 15-17 Lakhs. It will also help you save substantial amount of money. You have to ensure that the renewal dates of your super top-up plan and base plan are similar. Network hospitals are a group of hospitals that are in collaboration with a third party administrator or health Insurance firm to provide policyholders with top notch cashless service in time of emergencies. So, you should be on the lookout for that health insurance company in India that boast highest number of network hospitals. 11. Compare premiums to grab the best deal available You shouldn't just settle with the very first health insurance plan that you come across even if it meets all your criteria. Instead, you should compare policies with similar coverage in terms of premium to find the most cost-effective health insurance plan in India. GIBL facilitates easy yet detailed policy comparison for prospective policy buyers like you. You just have to put in some basic details to get a list of quotes. A detailed comparison is the key to find the best health insurance policy in India with lowest premium. You should do research about insurance companies that you have shortlisted to make a purchase. You can search for bad reviews, ask people around to assess the reputation of companies when it comes to settling claims and responding to policyholders in crisis moments. Traditionally, we trust the opinion of our relatives and friends and opt for health plans that they suggest. While there is no harm in asking for opinion you should also do some research on your own. 13. Keep abreast of the policy wordings of health covers To ensure what's in store and what's not you should read the policy wordings carefully. Once you find a health insurance plan worth investing you can search for the brochure in pdf file of that very plan online. 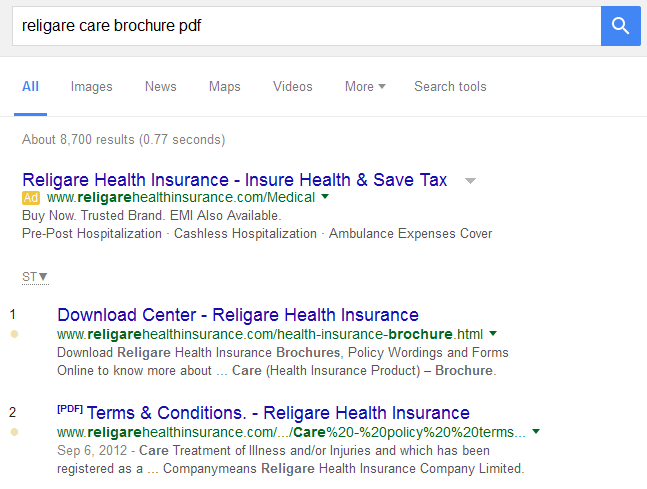 You just have to search by brochure pdf along with the name of the health plan you seek. I wanted to read the policy wordings of 'Care' plan by Religare. So I made a simple search on the Google and found the pdf brochure of the plan instantly. 14. Ignore expensive plans with unnecessary coverage So far, you gained information on what to look for and now you need to know what to avoid. There are many unnecessary features in the likes of ambulance, domiciliary expenses that make the price of a health plan high. You better overlook these features and focus on more significant offerings such as hospital network, Room rent, doctor consultation fees. Features like ambulance costs can be managed by you so you don't need to pay extra premium for such insignificant facilities. You should learn to ignore unnecessary coverage. 15. Don’t waste time in searching for a perfect health insurance policy Many people crave for a dream health plan that comes with highest coverage, fastest claim settlement, least number of excluded diseases, lowest waiting period and lowest premium as well. Unfortunately, such a plan don't exist in reality. In essence, one health insurance plan cannot please all. If you trace out a plan that meets 8 out of your 10 criteria ou better settle with it instead of searching again for a plan that meets all your 10 criteria. This will only result in delay of having an adequate coverage which can be fatal if god forbids, you fall prey to a serious illness while being uncovered by any health plan. As the medical costs are going over the roof across the world you might be struggling to pay hospital bills if you don't have a comprehensive health cover. Health insurance plans not only offer peace of mind in time of medical emergencies but they are also beneficial in terms of tax deduction. However, a lay person may well find all policies identical and this 15 point checklist will guide him or her to find the best health insurance plan in 2016 in India. At GIBL you can compare all health insurance plans available in India and check out all 15 points quickly and easily to make an informed decision. Once you select a particular health insurance policy you can also buy the plan by making the payment right on the GIBL portal and get the soft copy of the health plan on your mail id.